Peacemaker Lobster & Crab Co.
A Peacemaker is actually an oyster sandwich that fisherman would give to their wives after they stayed out all night drinking. 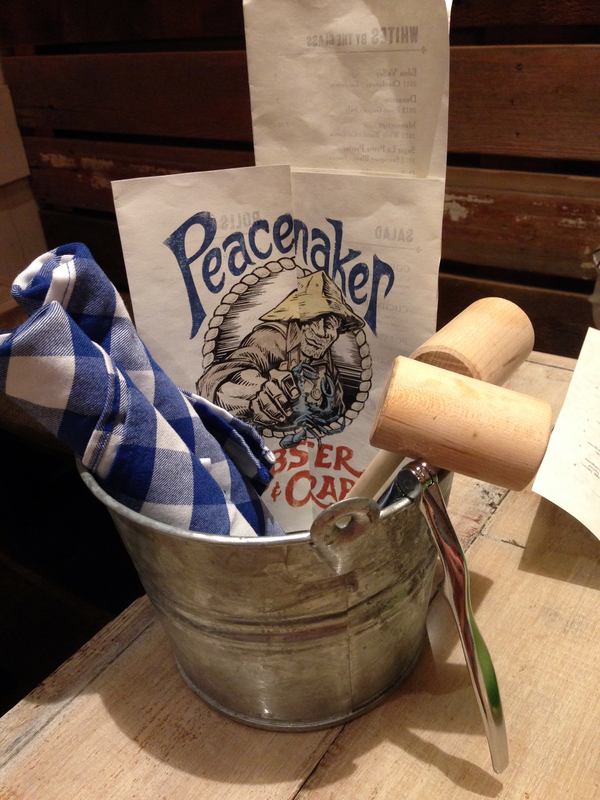 As someone who is obsessed with seafood, I could not wait to check out Kevin Nashan’s new restaurant, Peacemaker Lobster & Crab Co. Let’s be honest, options for this type of cuisine are lacking in this area of the country. I knew trying to get into this popular restaurant would be a challenge on a Friday night, especially since they do not take reservations. However, I found out that the restaurant supports the use of the app called NoWait which lets you put your name in line before you ever get to the restaurant. After putting my name on 90 minute wait-list, I was able hang out at home for an hour and get to the restaurant to be seated in just 10 minutes! Our short wait was spent at the bar where I ordered a bourbon slushy. I am not a huge bourbon fan but I cannot resist a slushy, especially when it comes in a colorful mason jar. I was pleasantly surprised by the drink and it is just mild enough for a bourbon beginner. As I waited at the bar, I couldn’t help but take notice of the atmosphere and décor. The restaurant is rustic and bright with large pictures on the walls of the actual fishermen who catch some of the food that is served in the restaurant. Reclaimed wood from an old Missouri barn has been turned into many of the tables and structures used throughout the space. There are buckets on all of the tables with wooden mallets and metal crackers to be used with your meal. We were seated and quickly greeted by our waiter who went over the menu with us in detail. The restaurant features a raw bar serving oysters, clams, and crudo. If you are looking to work a bit for your food, you can opt for the boils and steamers with the choice of lobster, shrimp, crab, mussels, and clams. The most popular item on the menu is the lobster roll, served either warm or cold. There are other roll options as well as poor boys, salads, soups, and sides. If you are watching your wallet, be sure to ask about the prices because many of the items are charged based on market price and your bill will add up quickly. I decided to start with the yellowtail crudo. The large portion of fish was incredibly fresh and was topped with cilantro, jalapenos, and crunchy corn for texture. My husband chose the clam chowder which actually confused me just a bit. The clams were hard to come by and the chowder tasted more like a potato soup with bacon. The flavor was good; I just think I would have enjoyed it more had I not been expecting a true, New England clam chowder. Next, I chose the steamed bun roll which were three Asian sticky buns stuffed with lobster, sour cabbage, and tarragon aioli. These sandwiches were quite small and served with nothing on the side. Although the sandwiches are unique and tasty, they left me hungry. If I had to do it again, I would order the more substantial looking and highly praised Lobster roll. My husband opted to be a little more adventurous and ordered the crab boil. 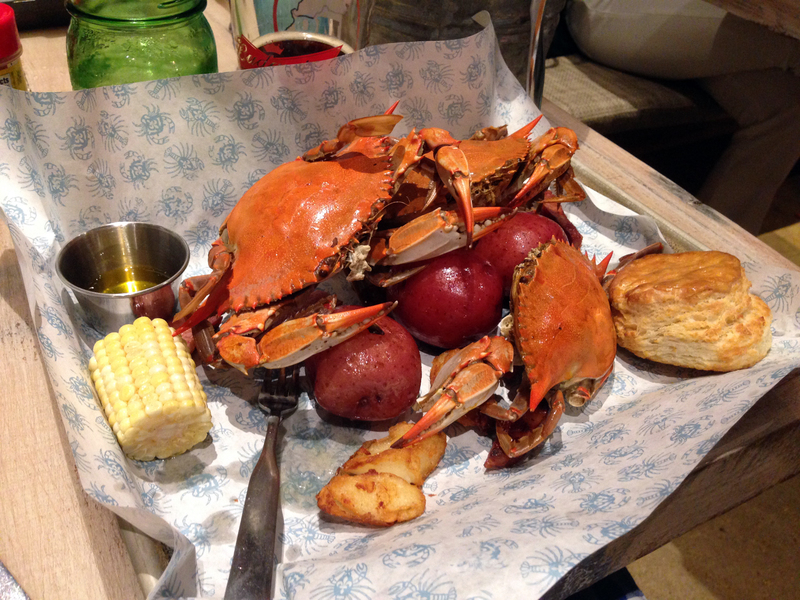 After all, how often do you see fresh crab on a menu in St. Louis? The crabs being served that night were fresh Maryland Crabs that arrived off of a plane just a few hours before being served. His plate had three crabs, Andouille sausage, a buttermilk biscuit, potatoes, as well as the tiniest piece of corn I have ever seen. To say that these crabs were a lot of work is an understatement. To put it in perspective, by the time we finished cracking these crabs, our dish of butter had solidified. Although the idea of cracking your own fresh crabs is exciting, the amount of work it took for such little meat did not seem worth it. We were both still hungry after finishing our meals so we decided to end with dessert. 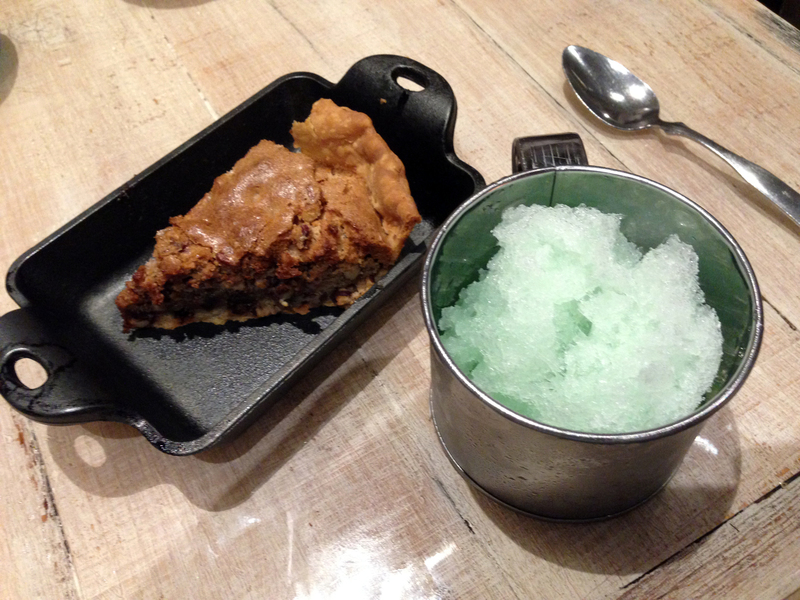 We chose the snow cone (yes, a snow cone) with house-made lime syrup and chocolate pecan pie. The pie was served warm with a perfectly brown, flaky crust and was just the right end to the meal. While the meal was good, I was expecting a little more creativity in the menu. However, there was so much to love about this restaurant that I will definitely be back to give it another try. Don’t forget to click Follow Me at the top of the page to receive all of my new posts!